With the seemingly unending expanse of tea estates that cover the rolling hills and valleys wreathed in a cool mist, Munnar is a favoured vacation spot in South India. This enchanting town offers visitors a relief from the summer heat and offers scenic vistas with a slice of adventure as well. Munnar tourism has gained popularity for being a honeymoon destination, attracting romantics for a memorable honeymoon experience. For its scenic beauty, Munnar is one of the best places to stop by during a Kerala tour packages. Experience an elephant ride together, try out delicious local food, gape at the scenic beauty of the countryside from the various viewpoints and spend some great moments of togetherness trekking through the tea plantations. Explore charming Munnar with honeymoon packages from SOTC. Home to exotic flora and fauna, and nestled among the mountains of the Western Ghats, this hill station offers a sanctuary to many endangered species of animals, at Eravikulam National Park and Kurinjimala Sanctuary. Witness the majesty of Anamudi Peak, the highest peak in South India, which can be seen from Munnar. Munnar also has several pristine lakes and reservoirs surrounded by tall mountains that exude a serene aura that calms your spirit and kindles the fires of romance in your heart. One of the popular tourist places in Munnar is Eravikulam National Park, a trekker’s paradise, offering a magnificent view of the tea plantations caressed by blankets of mists. If the adventurous honeymoon is your wish, there are many options you can explore on your Munnar honeymoon. You can go hiking, jeep safari, bicycling or visit the elephant camp amongst the other things to do in Munnar. For the romantics, explore the beautiful tea gardens or visit the Tea Museum, or marvel at the beautiful scenery and catch a great sunset amidst the hills, with your beloved. Spend some memorable time together walking in the Rose Garden or Blossom Park. One of the places to visit in Munnar is Echo Point, a serene, calm lake bank. When you scream here, you'll be hearing your voice echoed back at you. Mattupetti Dam is popular for various activities like speed boating and horse riding. The honeymoon packages offer you a visit to the well-known Elephant arrival spot where you and your beloved can enjoy an elephant ride together to explore the wilderness of the region. 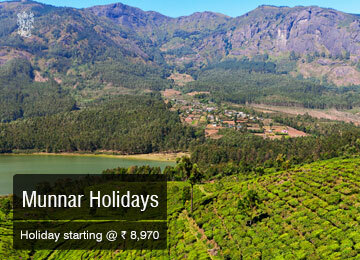 The best time to visit Munnar is from October to March. During winters the weather in Munnar is very cool and it’s a perfect time for a honeymoon. Summers from March to May are pleasant and the weather is good for sightseeing. Monsoons can be avoided. 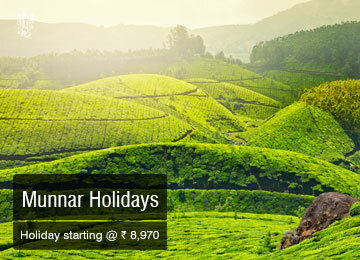 Explore the pristine beauty of Munnar with Munnar honeymoon packages. Get bowled over by the colonial-era charm, the hilly roads and the gorgeous scenery of the ‘Scotland of the East’, Shillong, express your love in the charming snow clad hills and the blossoming wild flower laden landscapes of Gulmarg or sail on an exquisite houseboat in Kumarakom. Explore the best honeymoon packages and exclusive India honeymoon packages by SOTC. A variety of teas flourish on the plantations scattered around Munnar and taking a tour of these tea plantations makes for an enlightening experience. Depending on the time of year, you can see tea buds being cultivated and harvested. Sampling tea at the town’s tea plantations is a year-round activity! Don’t forget to try the delicious Kerala sadya. It is a delicious Kerala thali served on a banana leaf. Buy your stock of spices in the local market. They are of good quality and reasonably priced. Try couples Ayurveda massage. It is very rejuvenating and relaxing and a fun thing to do with your spouse.